There are many benefits to having a shed in your backyard. One of the most obvious of those benefits is the extra storage you’ll have now created. This doesn’t have to be dedicated to yard tools and equipment. You can store virtually anything you want in your new shed if it is able to withstand the elements. 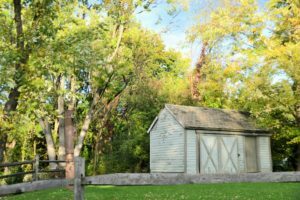 Remember, unless you build your shed airtight and temperature controlled, your items are going to be exposed to temperature changes and the humidity that comes with Wisconsin weather. That humidity is the biggest enemy of all; able to wreak havoc on your electronic items as well as any antiques you may be thinking about storing. Obviously there are things you can do to your shed to counter these two foes. Adding a dehumidifier is going to be the most important step. Next would be durable weather stripping to help keep debris and insects out as much as possible. That being said, placing insect traps or spraying around the boarder of your shed would be a good idea to prevent them from potentially feasting on your items. There are so many things you can do with a shed that go beyond freeing up space in other areas of the home or garage. Like “man caves”, there are “She Sheds”. While this is a simple play on words, it really shows that it can be a great little getaway from the home where you can actually find peace and quiet for a change. It’s also a place where that hobby you set aside years ago can flourish once again. What we’re saying is that you can purpose your “shed” for whatever reason you see fit. Also, it can be repurposed at any time when your needs change. Maybe make it a personal movie theater with seating for up to ten. With your own bathrooms so close and all the snacks you can handle right in your kitchen, you’ll never want to go back to the theaters again! So let your imagination run wild with ideas for how you’ll use your new shed. When you settle on one, come down to Brunsell as we have the materials you’ll need for your project, as well as the experts who can help guide you along. So stop in and get started, what are you waiting for? This entry was posted in DIY, Storage and tagged Custom Storage, Lumber, Shed, Storage. Bookmark the permalink.